You have to wonder what's going on behind closed doors at Sony HQ. Is it going into meltdown as it silently watches a bunch of prematurely released new consoles dissected from every angle weeks before its official reveal? Or is it sat back, enjoying a wry smile and a chuckle while we all froth at the mouth over the world's most brutal fake out? Well, turns out that 'fresh take' is little more than the addition of another lightbar to the front of the controller. No honestly, that's it. The coloured light at the back of the pad remains where it usually sits, as does every other button, only now we have a thin sliver of light sat across the very top of the touchpad. 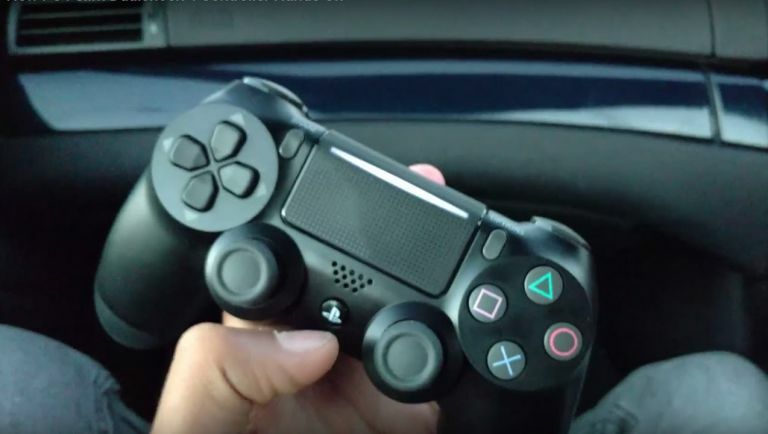 There's no need to worry about this potential new version draining even more juice out of your DS4 either - if the footage is to be believed, the lightbar is in fact lit by the same light that illuminates the back-facing lightbar so there's a good chance the PS4 Slim DS4 will run out no faster than its vanilla predecessor. So is this all BS or the real deal? We've heard rumours that Sony is planning to launch the PS4 Slim next month, shortly after the reported big reveal on 7 September. If this is the case, fully boxed versions making their way into the wild does make some sense.